amongst others “The Liberation of Sound” by Varèse. It struck me how much Varèse’s thoughts resonate with today’s GPS sound walk and audio mapping projects when he uses metaphors of cartography to describe spatialisations of sound. Of course, he was not imagining to place electronic or computer-generated sounds in physical landscapes. In fact, Varèse describes the idea of using timbre ‘like the different colors on a map separating different areas’ (Varèse 2005:18). Todays’s digital landscapes or network landscapes with its overlayerings of physical and digital landscapes and networks allow artists to take Varèse’s ideas one step further. Software such as Mobile Bristol’s mscape, for example, where maps can be imported and then visually annotated with colour areas on screen, referencing media files (e.g. sound) that are being played to the people walking the indicated zones in the annotated area via mobile media devices. This, such as all visual sound interfaces are to be approached with critical distance as it distracts from the sonic and as all software shapes what is possible and what artists can do and imagine to do with it, as Teri Rueb reminded me in an interview I did with her recently after experiencing “Core Sample” in Boston. 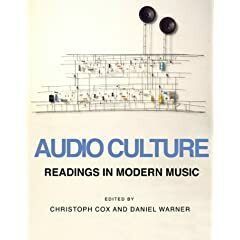 Varèse, Edgar (2005), ‘The Liberation of Sound’, in Cox, Christoph and Daniel Warner (eds. ), Audio Culture. Readings in Modern Music New York: Continuum), 17-21.